We were enjoying our late afternoon hike in Frozen Head State Park outside of Oakridge TN, when I came across a solo ranger with a chain saw working on a large logjam. “Hi,” I said. Joe enjoyed the interruption. “Do you have any volunteers to help?” I asked. “No,” he replied. Then I did what I always do best. “Larry will give you a hand; here he comes now.” I’m always volunteering my husband of 47 years. He just set the date for what he calls his Darth Vader knee replacement earlier that day. 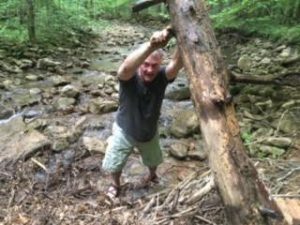 “This logjam is causing water to spill onto the graveled path,” said Joe. Larry, a former contractor and teacher, looked at the situation and came up with a workable solution. The two entered the stream thigh deep and removed large branches and trees. As their cheerleader, I gladly stood on the sideline taking pictures I would add to my lifewithlarry.org blog. The ranger, a bit fearful of cutting the large root of the tree, gave it the go. “Boom!” It finally came to rest on the bottom of the stream where it would be much easier to dismantle. Joe beamed from ear to ear, and Larry was thrilled to use his knowledge and muscle as a 69 year old man to help in a random act of kindness. “It was the best part of the vacation,” he said as he asked the ranger to please hand him his silver cane.